Who doesn’t love movies? 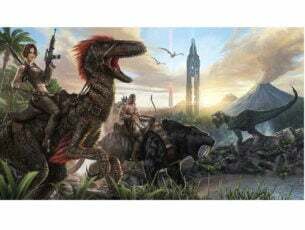 If you own a Windows 10, Windows 8 or Windows 8.1 tablet, then you’re probably searching for some of the best movie apps to download form the Windows Store. Look no further than this article as we have just what you need! All of you who have installed the new Microsoft operating system, Windows 10 and Windows 8, are now in the search for the best apps to personalize your computer or tablet. These apps promise to vastly improve your Windows 8 experience and make your device resemble an Android or iOS smartphone. We only hope that the Windows Store will be able to rise to the level of its competitors. 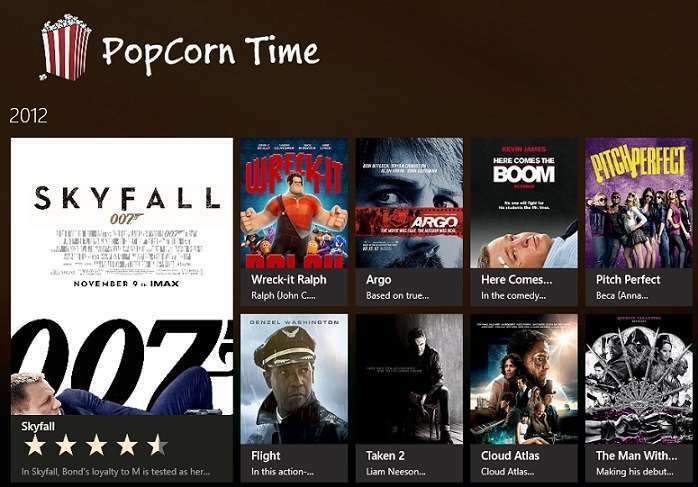 We hope that these movie apps for Windows 10 and Windows 8 will help you achieve that. An important aspect of mobile devices is the multimedia capabilities they possess, and it does not get more important than video playback. Movies are at the forefront of entertainment media, and thanks to this, app developers are struggling to give your Windows 10 and Windows 8 device some of the awesome apps and programs that are available on other platforms. 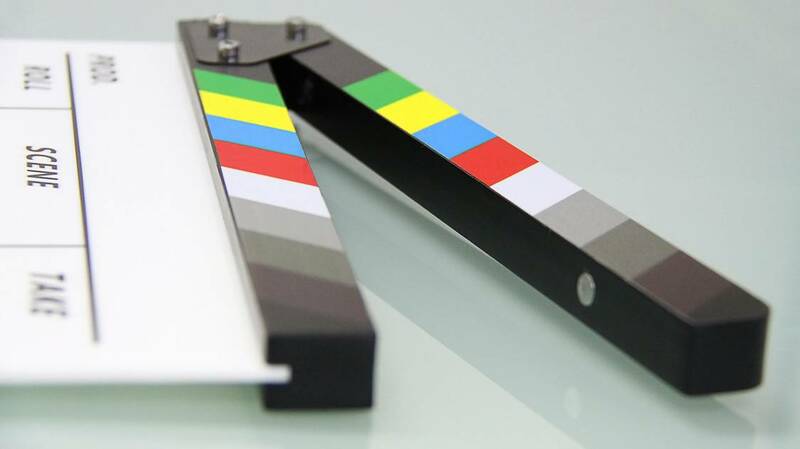 We’ve gathered some movie and video apps, because they basically share the same purpose – fulfill the needs for film fans. It’s true, there are not many good apps on the Windows Store right now, and some are less than perfect, but remember that the other app markets started the same way, and so, we must be patient with the developers and encourage them. Each update will give the apps more functionality and more features, and so, an app market similar to the other is just around the corner. Also, don’t forget to rate this apps in the store, so other users like you could know if they are of any use or not. This helps the community overall, that is, if you care for it, but we hope you do, because it will also help you know if an application os good or not, right before trying it out. Our top is purely personal and subjective, indeed, so don’t judge us too hard if we don’t meet your own personal criterias. We’ll be updating this article with fresh movie apps for Windows 10 and Windows 8 if we find any. We have listed 2 categories, because the second one can also be used to videos, not only movies. US citizens have enjoyed this service for quite some time now, and it’s no surprise: Netflix offers a wide variety of movies and episodes for users to enjoy. Now, you can use this service on your Windows 10 and Windows 8 computer via the free app available in the App Store. After installing and logging in, you will see how great the app is designed, but sadly, it still lacks some features. Maybe with the next updates, Netflix will get more features and will become an even more complete movie application for Windows 10 and Windows 8. For now, it’s a pretty well-crafted with a great reddish design. Vudu is an app which on you can buy or rent movies. You can join this service for free without subscription. It allows you to stream directly to your Windows 10 PC so you can enjoy movies anywhere. You can find there the latest movies before they are out on DVD. 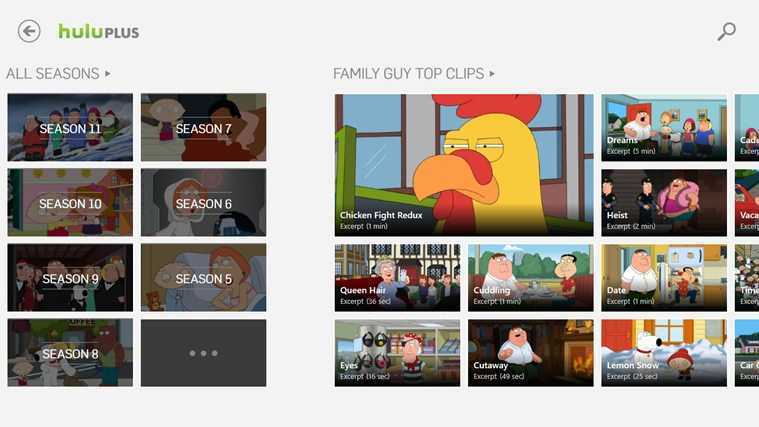 It also supports TV shows so you can watch episodes the day after broadcast. 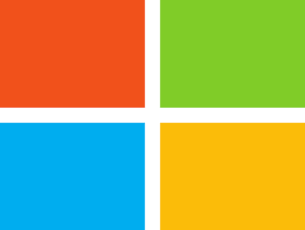 This app does not support Windows phones and tablets but it does for Android and iOS mobile devices. You can download it from the store for free and give it a try. Similar to Xbox Movies, but with a touch of IMDB, Movie Guide is a wonderful Windows 10 and Windows 8 movie app for all movie lovers. You can use it to browse through a database of over 70000 titles and see information about actors and their movies. The app runs very quick and you can also see trailers, so this is one of the best apps around. We hope that future updates will bring more movies and more information to the database. What I particularly like about it was the choice of background images for every movie, just like we’ve mentioned in the review. Just like the other Xbox apps, the Video section is pretty good. Although, as a video player it needs lots of work to be done to it before it can be compared to other players, it does give you nice features and integration with your other devices, such as your Xbox console and SmartGlass technology. For now, better stick to other players, but keep this app in mind if you are in need of information about a movie. You don’t even have to look for it in the Windows Store, as it comes pre-installed in your Windows 8 system under the “Video” name. 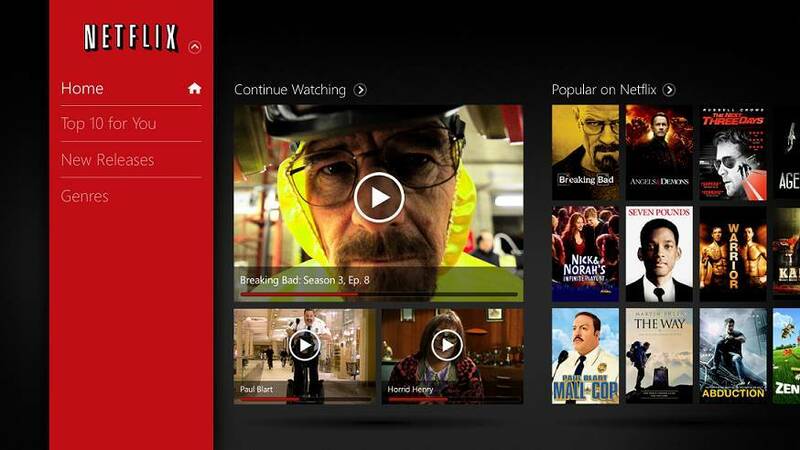 It also allows you to put your video in the same place where your movies and TV shows are. Hulu is a well known service that allows you to watch your favorite shows online, with great picture quality and without any interruptions. Although limited to the US, you can still access this service from other countries if you use the latest version of Chrome or Firefox with the use of a great extension. Keep in mind that the service is not free, so must pay a fee for watching movie online via Hulu Plus. There’s one awesome feature that film and TV shows fans will appreciate – you can watch videos while you’re working (if your boss doesn’t mind). 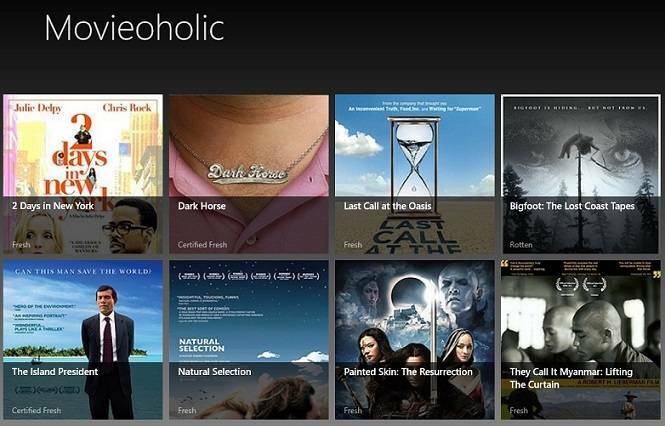 By now, you’re probably used to the common layout of movie apps for Windows 10 and Windows 8. Popcorn Time follows it by slightly changes it. You now have a long column with 2 rows of movies, all of them being Box Office Blockbusters. There’s also a special spot for a movie from 2011, which currently is the last year. But, don’t worry, you can change the genre and there are quite a lot there actually. You’ll find such unusual genres as “Film Noir”, “Disaster”, “Education”, “Indie”, “Neo-noir”, “Road movie” and many others. There’s also the possibility to change categories, from “Box Office” to “In Theaters” and “Up Coming”. Basic and very nippy movie application. 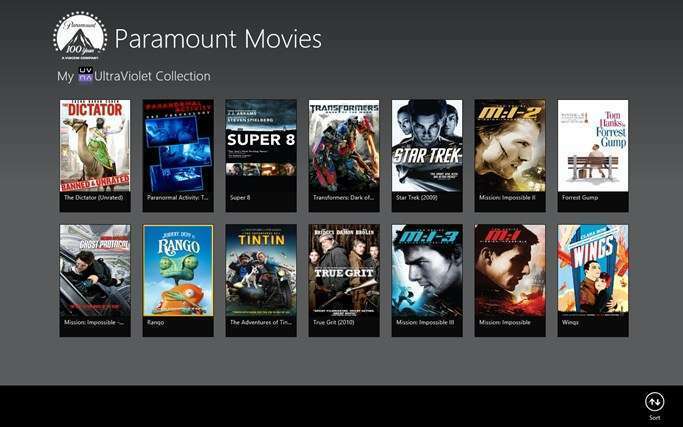 Paramount Movies is a movie application that will stream, that’s right, movies only from the Paramount production company. It doesn’t have such a great rating, maybe because it doesn’t allow users to purchase movies, as they have to have purchased the movie on their Paramount account. So, basically, the Paramount Movies application in the Windows Store serves as a “mirror” to the movies that you have purchased on your Paramount account. Works well for Paramount users, but that’s just it. Movie ShowTime is a movie application that will display the movies that are available in your location. So, when you first open the application, you will be asked to input a location so that the system could find movies that are near you. Sadly, it won’t work for all the countries in the world, so there’s a chance that if you’re not living in “rich” or known countries, the application won’t be able to find the show time for movies in your location. Another drawback is that some movies might not have thumbnails. If you select a movie, you will be showed the list of theaters where it is played and a trailer. Pretty neat. Other than that, serves you great. Movie Finder is a good mix of movie show times and ratings. In terms of design, you won’t find things very different here. What I liked about this movie application and what would be a good addition is the use of ratings. I still don’t understand how they achieved that score, which is very different from the IMDB score, for example, but my best guess is that they make an average of the most influential ones, from newspapers like Washington Post and New York Times. Local Movie database is a totally different movie application for Windows 10 and Windows 8 (and yes, with a different design) that will be highly appreciated by movie fans and picture-goers from all over the world. I’ll spill the beans and say the following – this is my favorite movie application from this whole big list. Why? Well, because it’s made in a “geeky” way. First of all, you can search for movies and they are not simply presented to you like many other apps do. This one is an application for those that are really passionate about movies. Basically, you’re selecting the movies that you like, for example and then you’ll have your own database. Something like a watchlist, but with extended functionalities. Also, another neat feature allows you to import movies from your hard drive. So, if you have your HDD packed with movies, a good way to make some extra storage space would be to import their names and delete them, as you can always download them later. The creators of this app have done a good job, that’s all I must and will say. A video sharing service, very similar to Google’s YouTube that can be of great use. Just like its counterpart, you have the possibility to watch videos in HD format. You can upload your own videos to this service (within a 500MB/week limit) and share them with the rest of the world just as you would do on YouTube. Just like YouTube and other apps presented here, this is more a video-oriented app than a movie one, but you can also find movies in chunks, if you search good enough. 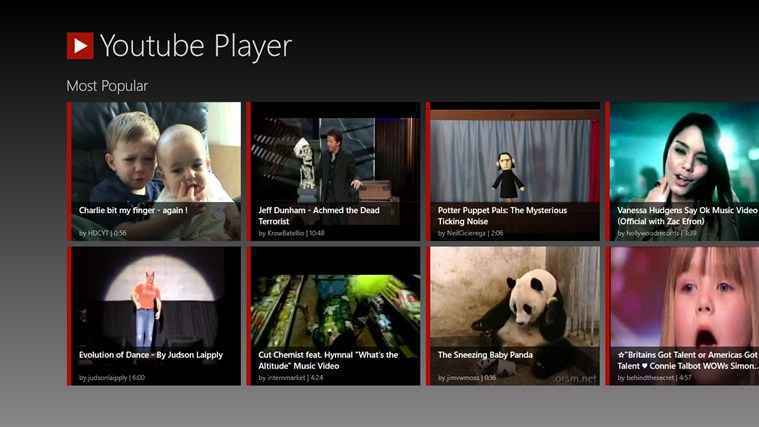 The YouTube app from Windows 10, Windows 8 allows you to add your favorite channels and it will fetch all the videos from them automatically. This is a great way to keep track of your subscriptions and see new and old videos posted by your favorite subscriptions. The app itself is very simple. All you have to do is write the names of your favorite channels and it will show you your personalized feed, so in this regard, it’s very intuitive. Obviously, this is the most known video application in the whole white world, so use it with confidence. Great movie application for those that want to test their movie knowledge. You’ll be presented with audio clips from different movies and you’ll have to recognize from which movie that audio clip is. You also have a Google Search function at your disposal, if you can’t rely only on your own knowledge. You’ll also get points for your answer – pluses for right answers and minuses for wrong answers. Movie afficionados will find it delightful. The design is not that great and the images look like they’re cut in half. These guys really need to improve their application if they want to get more users trying it out. Otherwise, I don’t see why they even bothered to create a movie application. You might ask why I decide to put it this list. I think they’ll improve this application and it will become useful for film fans all over the world. I like the idea of seeing Movie News on my start screen, and I hope they can better it. 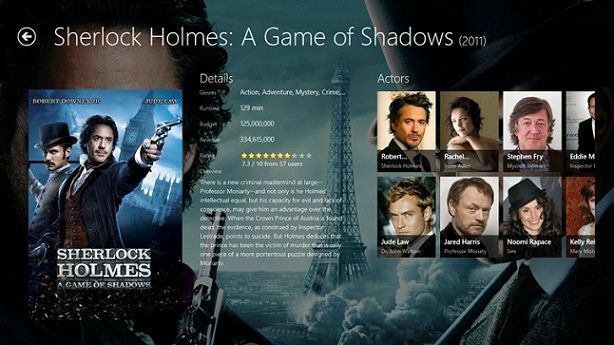 This is one of the best designed movie applications in the Windows Store at the moment. Sadly, it’s only available in Romanian language, so those speaking that language will greatly appreciate it. So, this app will work for those living in Romania, Moldova and generally, for those that speak Romanian. I decided to include it in this post because it has an awesome design and great functionality. Just like Cinemagia, Kino Poisk is an application that is available only in Russian language, and the reason why it made this top is that I am sure there are English speaking persons that can speak Russian, as well, and will find it very useful. I hope Russian readers will find it pretty useful for their needs. As you can see, there are enough apps available in the Windows 10, Windows 8 Store that will help you watch videos and movies. 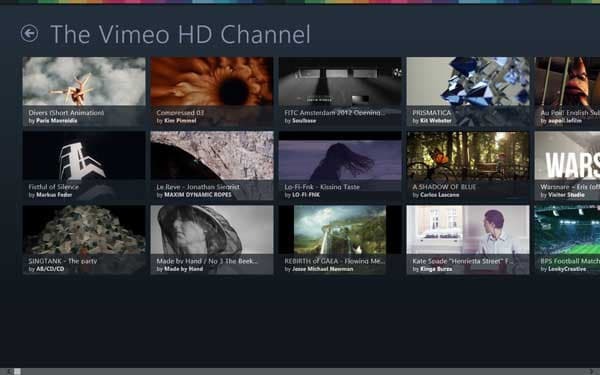 Also, these Windows 8 movie and video apps will give you much more than the possibility to watch movies, but also they will provide information about movies, releases and much more. Give them a try and see how they can help your Windows 10, Windows 8 become much more functional and gain new features. Editor’s Note: This post was originally published in November, 2015 and has been since revamped and updated for freshness, accuracy, and comprehensiveness.